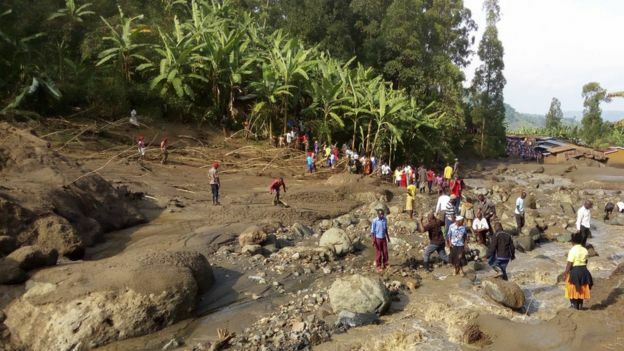 A landslide following heavy rains in eastern Uganda has killed more than 40 people. It is feared that the death toll could rise as a government rescue team reaches the Mount Elgon area. A river burst its banks and a torrent of mud and water swept villages away. Pictures from the scene show people retrieving bodies from the mud and carrying them away. A landslide in the same region, Bududa, killed more than 300 people in 2010. Uganda law halts 7 year old rapper’s career for now. Uganda Police: BBC journalists arrested for illegal possession of drugs. Ugandans flood social media with disappointment comments over women objectifying. Uganda foreign minister Sam Kutesa faces investigation over bribe allegations- Museveni. President Museveni reveal plans 2 combat corruption soon in Uganda. Uganda: Raging fire kills nine students in boarding School.